Ayman Nour is a Partner heading the Corporate Structuring department in Egypt office. Ayman is also a member of the Education, Healthcare, Sports & Event Management and Hotel & Leisure sector groups. Ayman specialises in corporate, civil, labour, dispute resolution and banking law. He represents local and multinational corporations and institutions, many of which are entities listed on NYSE or the Egyptian Exchange and/or on the Global 100 List. Ayman has extensive experience in local and international commercial transactions, having worked in the M&A team of international law firms. He is also well experienced in general corporate, labor and civil matters alongside corporate structuring for major multinational corporations. 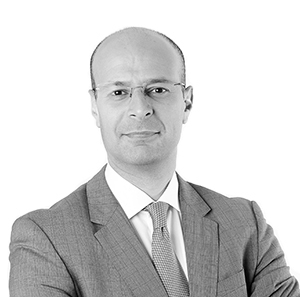 Prior to becoming a Partner in the Firm, Ayman was a partner associated with a British law firm, from 2003 to 2010. Between 1995 and 2003 Ayman worked for two intermittent periods with Baker & McKenzie in Cairo for five years. Between such periods, he worked as an Assistant District Attorney with the Egyptian Public Prosecutor Office from 1997 to 2000. Advising on health care transactions and restructuring, investment bank acquisition, hotel employment matters and retail day to day business requirements. Advising Sanpaolo IMI on the acquisition of 80% of the shares of Bank of Alexandria for $1.6 billion, what is considered to be the first privatization in Egypt of a state-owned bank. Advising Cessna Finance Corporation on a multimillion dollars aircraft lease. Advising Commercial Bank of Kuwait in its bid to acquire the majority shares of Al Watany Bank of Egypt. Advising Exim Bank of the US on project finance deal and transaction.